Wind and solar may be currently leading the way in Australia’s renewable energy race, but there’s another contender lurking in the nation’s oceans. Australia arguably possesses the world’s largest wave energy resource, around 1,800 terawatt hours. Most of this is concentrated in the southern half of the continent, between Geraldton and Brisbane. To put this in context, Australia used 248 terawatt hours of electricity in 2013-14. Waves aren’t the only renewable power source in our oceans. The daily movements of the tides shift vast amounts of water around the Australian coast, and technology for conversion of tidal energy to electricity is more mature than any wave converters. Ocean renewable energy also spans ocean thermal energy conversion, and energy captured from our large ocean currents (such as the East Australian Current). These represent less mature technologies with less opportunity in Australia. Australia has abundant energy resources – both renewables and fossil fuels. So what will it take to get ocean energy out of the water, and into our homes? The Paris Agreement, to which Australia is a signatory, aims to limit global warming to well-below 2?. This will require almost complete decarbonisation of global electricity systems by 2050. Of the 248 terawatt hours of electricity used in Australia, around 17 terawatt hours of this came from large scale renewable energy technology, equivalent to about half of Australia’s Renewable Energy Target of 33 terawatt hours by 2020. To keep us on track to meet our international commitments, members of Australia’s Climate Change Authority recently proposed a target of 65% by 2030. This would require a rapid, large scale transition to alternative emission-free energy systems. Wind and solar are currently leading the way, but we’ll need other technologies. This is not only to boost low emissions energy supply, but also to overcome the problem of intermittency due to the natural variability of the energy sources (when the sun doesn’t shine, or when the wind doesn’t blow). 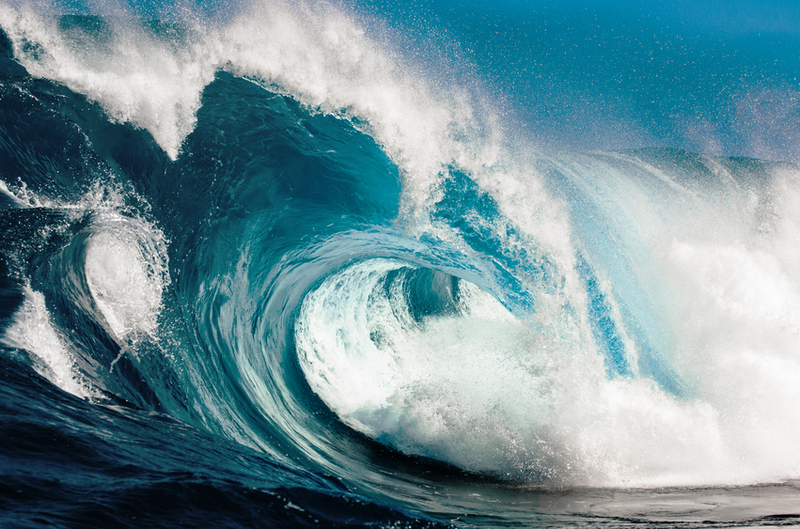 Ocean renewable energy technologies (including wave and tidal) are emerging as a future contributor to Australia’s energy mix, and have a number of advantages over other sources. Both wave and tidal energy devices are deployed offshore (not taking up limited land space) and are typically out of sight (deployed under the surface, or sufficiently offshore and low profile to not be obvious to the casual observer). Although ocean energy resources also vary day-to-day like wind and solar, wave power has only a third of the variability of wind power. It can also be forecast three-times further ahead than wind. Tidal energy is predictable over very long time-frames. These attributes provide an advantage in a portfolio of clean energy technologies and have led to notable government and other investments in ocean renewable energy technologies in Australia. The Australian Renewable Energy Agency (ARENA) has contributed more than A$44.3 million to at least nine ocean renewable energy projects to date (two closed before completion owing to technical and financial challenges). With other funds, more than A$122 million has been invested in ocean energy in Australia. These funds have supported demonstration projects, including notable international successes (Carnegie Wave Energy Ltd, and BioPower Systems), and other research. Several other demonstration projects have also been undertaken in recent years by start-up companies with self-funded support, and unique technologies. The expected installed capacity from approved ocean projects in Australia is around 3.5 megawatts. So far total global installed capacity of wave energy projects is less than 5 megawatts. The EU has also been a major investor in wave energy projects, with approximately €185 million (around A$275 million) invested to date, for a total expected installed capacity of 26 megawatts by 2018. Although tidal energy converters are the most ready of ocean renewables, a high-quality assessment of Australia’s national tidal energy resource is yet to be done. Nevertheless several prospective sites in northern Australia and near Tasmania are attracting national and international attention for potential development owing to their attractive resource. Significant projects are in development, particularly in Europe, where tidal installed capacity is set to increase to about 57 megawatts by 2018. At the moment, the lifetime costs of ocean energy technologies are high. Until there are more than 10 megawatts of wave energy installed globally, costs will remain around A$500-900 per megawatt hour. By comparison, in 1981, when there were less than 10 megawatts of installed wind energy capacity, wind turbines cost around A$720 per megawatt hour. In 1990 there were 2 gigawatts, and costs fell to around A$190 per megawatt hour. Now there are around 500 gigawatts of installed wind energy, and the cost of onshore wind is around A$110 per megawatt hour, similar to coal. This experience suggests that costs for wave energy will decrease to A$170-340 per megawatt hour when installed capacity reaches 2 gigawatts. But costs should not be the only performance indicator for ocean renewables. Options are being explored to combine and integrate design of other infrastructure (such as wave energy capture as a coastal protection mechanism, powering offshore aquaculture, or recreational amenities) which will reduce relative costs. To put ocean energy generators in our seas, planners, operators and financiers will increasingly require more knowledge of how much energy is available and where. These decision-makers also need to understand barriers or constraints to ocean energy (in particular areas such as access to transmission infrastructure, or other uses of the sea such as fishing, aquaculture, tourism, shipping, ports, marine-protected areas). To help answer these questions, ARENA and CSIRO have developed the Australian Wave Energy Atlas. The atlas provides wave energy resource information together with details of available electricity infrastructure and spatial constraints for deployment. This allows users to identify the most viable sites for future wave energy projects, and ultimately ease the process of attracting capital and negotiating the consenting process. While ocean renewable energy has many attractive features, there are still many challenges. The advantages of consistency and predictability of ocean energy become diminished if costs don’t fall below those of wind or solar supplemented with storage, which will offer the same advantages. Other challenges include the technological advances needed to make generation devices ready and reduce costs; policy and regulatory barriers to project development; lack of awareness of ocean renewables and the potential they provide; limited body of knowledge on the environmental effects of large scale deployments; and the finance mechanisms to support the growing industry. To overcome these challenges we’ll need to bring decision-makers, researchers, manufacturers, and businesses together to unlock the potential of our oceans. The Australian Ocean Renewable Energy Symposium, running from today until October 20.